When Apple launched the original iPod in October 2001, CEO Steve Jobs boldly claimed that “listening to music will never be the same again”. 350 million sold devices later, few would deny Apple’s successful attempt to revolutionise the MP3 player industry. Despite often being cited as the best invention of the 21st century, with annual sales halving in less than five years, the iPod’s heyday appears to be over. It is therefore worth looking at the rapid rise and fall in the context of the Product Lifecycle (PLC) to understand why Apple has allowed its original ‘cash cow’ to fade away without a whimper. Unbeknown to some, the MP3 player industry was not created by Apple with South Korean firm, SaeHan, launching the world’s first MP3 player into Asia in 1997. Despite this and a few other competitors, the iPod blew them all away with its “cool” factor, advanced technical capabilities, click-wheel control and soon-to-be unmistakable white headphones. In accordance with the Product Lifecycle theory, the iPod’s launch was initially a basic model, available in only 5GB or 10GB and with a hefty price price tag of £300. Through its awareness objectives and to build reputation as a credible brand, informative television advertising was used to demonstrate the product’s usage and emphasise the benefit of listening to music on-the-go. Despite the launch of the iTunes Music Store in 2003 and hardware progressions fuelling the creation of second and third generation iPods, unsurprisingly, Apple was facing growing competition that targeted its features and size. Archos launched the first device to display both images and video with its Jukebox Multimedia player, and Creative’s smaller player MuVo line was also very successful. The MP3 player had become the fastest growing consumer electronic product ever introduced and was rapidly gaining market acceptance. The ‘innovator’ market was reaching saturation, so an expanded product line was becoming crucial. Consequently, Apple sought to broaden its market appeal in 2004 with the launch of the iPod Mini and this became highly popular with teenagers and women due to its range of colours, smaller size and reduced price. Over the next three years, as typical of the growth stage, iPod Nano, Shuffle and Touch product extensions were launched to stave off competition from ‘me-too products’; including the likes of Samsung, with its YP-P2 touchscreen MP3 player, and Microsoft’s Zune. In addition to the arrival of Apple Stores to the UK in 2004, distribution channels were further expanded beyond electrical stores to include supermarkets such as Tesco (in 2005). Apple’s commitment to the iPod range was demonstrated in devoting 60% of total advertising spend to product line, in support of the memorable silhouette figures TV, print and outdoor campaign – helping Apple to a mammoth 72.7% MP3 player market share in 2007. 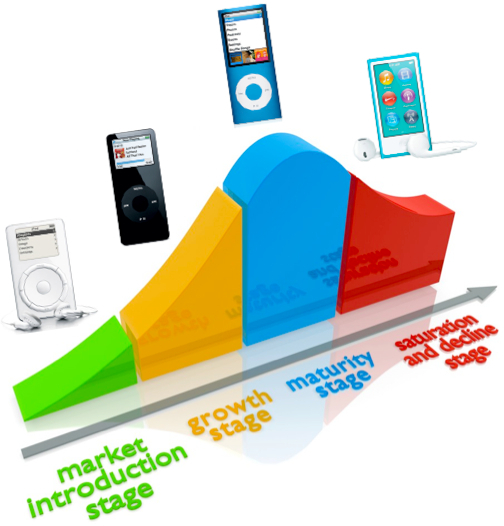 By 2008, the iPod can be said to have reached maturity with global sales peaking at 54.8m units. To expand sales and compete in mature markets, Michael Porter’s three key strategies for achieving a competitive advantage are a useful reference; cost leadership, differentiation and focus. Apple offers a fine example of successful differentiation. With each new iPod generation, Apple continually broke new ground in design and performance, including the introduction of colour screens, camera/video, Nike+ functionality and increased battery life – to name just a few few. Furthermore, the seamless ecosystem integration of the iPod with Mac PC, Apple TV and iCloud creates switching costs for consumers to justify a price premium. Arguably most importantly however is the strength of the Apple brand itself. More than a technology company, even back in 1997, the Guardian described Apple as “the marketing company of the decade”. Still today, Apple is seen to be all about imagination, design and innovation and people connect emotionally with the brand that creates an army of evangelists and a community that many more want to be apart of. A typical feature at the beginning of the maturity stage is shakeout of firms failing to successfully implement one of Michael Porter’s generic strategies, as typified by the exit of Microsoft’s Zune in 2011 – as well as many others. Earlier this year, Tim Cook, Apple CEO, said “I think all of us have known for some time that the iPod is a declining business”. Given the peak global sales in 2008, by 2013, this had dropped significantly to 26.3m; despite new generations of the iPod Touch and Nano launched as recently as 2012. This should not have been unexpected after Steve Jobs’ claim in 2007 that the iPhone launch was “the best iPod we’ve ever made” – meaning consumers have little need to own an iPod as a separate device and its sales were therefore inevitably cannibalised. Whilst the decline stage of the PLC is generally characterised by price discounts, the iPod is somewhat unconventional in that it maintains a premium pricing strategy to protect Apple’s brand image. This likely further contributes to declining sales as the iPod’s value subsides relative to both the iPhone and iPad products. The iPod offers a prime example of the ever-shortening Product Lifecycle in today’s age of rapid technological development. Whilst the tiny-but-mighty device will soon be a thing of the past, it will always be remembered as the dawn of Apple’s boom era which is now driven by the iPhone and iPad. This entry was posted in Branding and tagged Apple, Differentiation, iPod, Marketing, Michael Porter, MP3 player, PLC, Porter's Generic Strategies, Product Lifecycle. Bookmark the permalink.